Anna Maltz is one of my absolute favorite designers, she is inventive, smart, colourful and quircky and has opinions that she's not afraid of sharing (on instagram as @sweaterspotter and in Pom Pom Quarterly in her returning column). Other than that she's just a dear friend and fun and sweet gal to hang out with. And soon we'll get a chance to do just that; the 24th of February she will be here at Ja, Wol where we will celebrate her new book (Marlisle, a new direction in knitting) with a Grand Fest that's full of Marled drinks and goodies, treats and fun! Read more about the Book Presentation & Party here. The book is now available from our webshop and brick and mortar shop! Hi Anna! So... what's new? I’ve just published my second book, Marlisle: A New Direction in Knitting. It is a beautiful, 160 full-colour, litho-print book packed with photographs, knowledge, anecdotes and opinion to introduce you to the technique of Marlisle which I have been working on and teaching for the last few years. Marlisle is a word I made up for this technique of knitting. It mushes together ‘marl’, the term for two yarns being worked together and the ‘isle’ from fairlisle for the stranded colourwork aspect of it. I’ve done a lot of research and haven’t come across this technique being used. The few bits out there haven’t been under a united banner (as in, there hasn’t been a name for it), so I added Marlisle to the mix to help to identify it in the future. Hang on, a new technique? Is that possible? It feels as though it must exist, because it’s so intuitive and easy to slot into existing knitting practices, but I’ve not found many things that even looks like it. 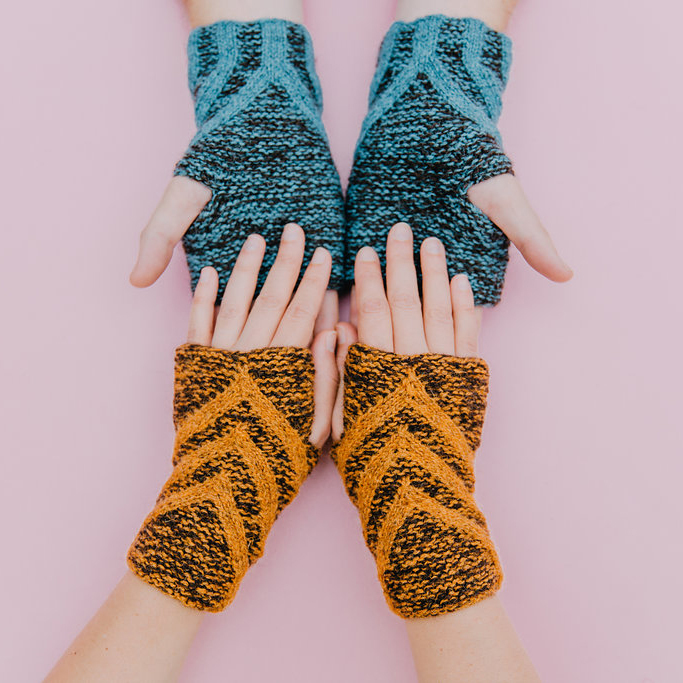 There’s an odd pattern or reference here and there, but these are one off projects from knitters and designers who have experimented with similar things. If not found anything extensive written or published on anything distinctly similar. Did you come up with it? From my point of view, yes, because it wasn’t something I learnt or observed, but instead came up with as a solution to a problem. It’s highly likely that there are others who have found the same solution – I’d love to meet them! So, it’s a totally new invention? Of course not! It’s knitting. Basically, it uses only the standard stitches of the knitting canon with minimal call for new terminology: knit and purl are used in combination with the increases and decreases needed to shape the garment. There is a handy increase you may not have encountered elsewhere that works specifically when you use two yarns held together and is, conveniently, easier to understand and work than most increases I’ve tried. And there’s a stitch combo worthy of its own abbreviation that makes working bobbles a lot neater. The rest is so standard that it feels odd that Marlisle has not been used more extensively — it opens up so many interesting avenues for creating unusual, decorative texture and colour shifts in handknitted fabric with a focus on seamless knitting in the round. Marlisle isn’t complicated. It is stranded colourwork with a marled and textured twist. You simply work some stitches with a single yarn and others with two held together to create the patterns. By holding two noticeably different colours of yarn double in some areas, and in others separated out and worked singly or as standard stranded colourwork, you are constantly using both yarns in one way or the other – you always have whichever colour you want available to work with singly (while the other floats briefly behind). This allows patches of stranded colourwork or single-colour motifs to be scattered around a garment against a consistent background, rather than necessarily worked regularly across a round. It’s for those who enjoy using at least a couple of different colours in one project and knitting in the round. If you aren’t a fan of sewing things together, these patterns will appeal to you too. I like to think they are patterns for curious and adventurous knitters. I’m going to be brave and guarantee that you’ll learn something new whatever level you’re at. Whether you are accomplished or just starting to gain confidence, this book embraces the joy that, in knitting, there is always something new to learn and try. Marlisle lets you reevaluate rules, your yarn and what you thought were the limits of knitting. Does that mean it’s suitable for beginners? Well, not in general, but it really depends what sort of beginner you are! We all approach knitting so differently. Some people jump straight into making sweaters and others will knit the same thing their whole life, either because they are perfectly happy and satisfied by that or because their confidence or curiosity doesn’t drive them to look beyond. This one is for the Beyond Lookers. How many patterns are in the book? There are 11 new patterns in Marlisle: A New Direction in Knitting. To break that down, there are a pair of fingerless mitts, mittens, two cowls, two hats, a scarf, shawl, cardigan and two sweaters. There’s also a sneaky little extra pattern in there that isn’t pictured, but will hopefully be inspiring to think about how you can apply the stitch patterns to other projects. In that sense, it is also a mini stitch dictionary. Are there just patterns in the book? The 11 patterns are sandwiched between an in depth look at Marlisle, offering extensive insight in how to adapt and add to your existing knowledge to successfully create stunning projects using this exciting, unexplored technique. Step-by-step instructions are interspersed with tips, tricks and opinion to educate, elevate and entertain. You’ll find a whole lot of advice on choosing yarns, what type of fabric you are after, a double-page spread on finishing and a chapter on how to avoid frustrations. You could also think of it as a technique book, a how-to, with bonus patterns. I like the idea that it could inspire people to create their own Marlisle projects and all the guidance in the book will be useful for that. How did you choose the yarns you worked with? Mostly I’ve used yarn from folks I know, but some I got to know through the process of making this book. They were all chosen to be relevant to the design inspiration and form of the pattern and to represent ideas of origin. There’s a lot of focus on single country and breed yarns at the moment. That language would be really bad if we translated it to humans – racist, xenophobic and nationalistic. While I can appreciate what that is being used as shorthand for in a woolly context, I prefer to look at the yarns and sheep as being local to a specific place. I’m very much invested in local, sustainable and transparent production, and discussing that stuff in the book is also a way to look at a rise in nationalism and FOMO – the joys and complications of that. What if you want to substitute yarn? I wanted to really highlight that you can slot in yarns that have meaning to you, wherever you come from and that you can combine different weights and brands to good effect to suit your tastes and pocket. Your local yarn shop is always a good port of call. Or Marlisle is a lovely way to reevaluate your stash, shedding new light on a yarn you had tucked away because it was finer than you wanted to tackle – in combo with the second yarn you’ll need for Marlisle, it adds up to a heavier weight. Or maybe the colour felt like it represented a former version of yourself — Marlisle lets you combine it with something new to bring it right up to scratch. Who else was involved in the patterns? There are almost too many people to mention! I don’t believe in the idea of a solo creative genius – it always takes a village! Drawing on her years of experience, Rosee Woodland was lovely and generous to work with as a tech editor. I then passed the patterns over to 43 different knitters in at least 10 different countries who made sure the patterns were put through their paces before going out into the world. This included more than half who do not speak (or read) English as a first language and a handful of dyslexic friends. I really wanted the patterns to be enjoyable to follow as well as well correct in the numbers and construction advice. Daphne Ruben, Rachel Rawlins and Saskia Maltz all helped my writing take shape by giving good feedback and then I handed it all over to Amelia Hodsdon for a critical eye on the more prose parts of the book (rather than the patterns themselves). Who are the models? I know that bearded fellow! He’s doing a fine job at modeling! Almost all the patterns are shown in two different colourways and worn by two different people. You might recognise me modelling a good portion of them. I know my own body best and I design knits I like to wear. It feels like it makes sense to show them on me. Variety is good and I spend so much time editing, that I’d go crazy if I had to look at my own face only, so you’ll see four different faces in the book. If you’re an Instagram regular, you might also recognise Marilla Walker, she sewed the majority of the clothes we are wearing from her own patterns. Vonnie is a new friend (originally a friend of a non-knitting friend). She’s a fellow Londoner who helped with knitting a few of the samples. And Adam, aka Mr Sweaterspotter also appears. We’re all in our 30s or 40s. Only Vonnie has some modelling experience and Marilla and I are both getting used to it doing it for our self-published patterns. It feels important to me to show the patterns on people I know. That’s such a tricky term. I know what it means, but it’s a complicated euphemism. It ends up being a back-handed compliment to someone. Everyone is real. But yeah, you’re unlikely to see the four of us turn up in the next issue of Vogue or on a tube station billboard for boohoo, Prada or Topshop. Being in pictures really makes you appreciate that being a model is a job and a skill – a profession. None of us are professionals, but we’re all invested in the project, in what I do. And I want to see more diversity in who is pictured in the world. I believe that it’s important to put my money where my mouth is. I can contribute by adding myself and my friends to that. It helps that we worked with Elle Benton, who’s a great photographer and made us all feel really comfortable. It’s hard to look at pictures of yourself and appreciate them, but I think it’s important to try and a good camera woman helps. And I mean a woman. The role of male photographer is so loaded. Are the patterns for women and men? Yes. Though the patterns are based on standard women’s sizing, the idea is that they will look good on many different types of body. The patterns are often accompanied by notes on adapting the patterns for fit preference and gauge. It’s not always possible, because of the stitch structure playing a big role in dictating the proportions, but I tend to mention where that’s the case or flag up where issues might occur. There are always at least 5 sizes for the sweaters and cardigans and generally at least two for the smaller projects. This means there’s already guidance how to size up or down. Plus, the joy of knitting is that it is wonderfully stretchy – it can fit all types of bodies. The clothes that aren’t knitted are really nice too. Where do come from? Marilla Walker! I approached Marilla to see if she would be up for collaborating. I love her patterns and approach to making. It’s also as a way of extending the creative, handmade possibilities of the book for those who buy it. It’s an entirely handmade and local vision. It means if someone likes the whole outfit, they can make the lot. The sewing patterns don’t come with the book, you have to go to Marilla for those. She sewed them all and we used them for the shoot. I got to keep a few of the things, which is an extra lovely memory of the collaboration. Last week when I was at the supermarket, the woman at the checkout complimented me on my coat and I got to beam and say, ‘my friend made it’. Then we had an ace conversation about the importance of making things and feminism. Did you work with a publisher? I decided to do it myself again. After learning the ropes with Penguin: A Knit Collection, I wanted to put all that knowledge to repeat use. Many things were a lot easier this time around. I knew so much more, but of course new things came up. It took a lot longer than I thought. I beat myself up about that until I realized Marlisle: A New Direction in Knitting is double the size: Penguin was 80 pages and this one is 160. Kristin has warned me that if I double it again, she’s off. The two folks most involved in making this possible have been Adam Rompel (aka Mr. Sweaterspotter) and Kristin Blom. You’ll see Adam modelling, but generally, he’s there as all round life and tech support – we’re a good team. Kristin has provided the smart, satisfying and knitterly design layout of the book adding fun, geometric illustrations to the pages, as well as all sorts of moral and intellectual support behind the scenes. I couldn’t do what I do without each of them. Books are wonderful things. They are such a comforting way to experience images and ideas. It’s a really nice way for me to be able to guide how you experience my patterns. Something about the tactility of a book goes well with knitting. You can scribble on them too – I made sure the paper I used was write-on-able. I love finding old knitting patterns in charity shops with someone’s notations on them (about how they tweaked the pattern or just kept track of their progress). And it’s lovely to get a nice package through the post, even if you did order it for yourself. What if you’re a knitter who likes to pack light? The physical book comes with a code to allow you to download a PDF copy. You can’t buy just the digital version. Will the patterns be available to purchase individually as downloads? Maybe one day. I didn’t make any of the Penguin patterns available individually until their second anniversary. Making a book is a huge gamble and investment, both in regards to the time and work put in, but also the finances of doing a print-run big enough to makes sense. I suppose I’m a little scared that I’d be left with a studio full of books if I had both options. Mostly though, it’s because I’d like it to be experienced in book form, because that’s what we’ve worked so hard to make. Seeing and feeling a real book IS a different experience. Kristin and I did a lot of thinking about how to make this a really joyous book to hold and use. Of course, if we’d had a bigger budget to play with, it would be a hardback and come with a secret gin compartment. You’ve suggested hashtags to use for each pattern in the book. Isn’t knitting too old fashioned for something as zippy as hashtags? A big portion of the knit community has been really quick to adopt all manner of new technology. I think we’re inherently a social lot and digital technology is just another way to communicate. A good portion of my knitting community has its hub on Instagram and the hashtags make it easy for us to find and celebrate each other’s projects. Plus I’m really curious to see what people make from my patterns and this will help me find them. I wouldn’t write patterns if I wasn’t! Celebrating! I’m excited to see Marlisle and the book go out into the world. I am so curious to see whether people will connect to the technique as much as I have. I find it so inspiring. Marlisle is simple and visually guided, yet creates so many possibilities. See you at the party Ja, Wol is giving for me and the book on the 23rd of Febrary!! After the party we'll start a Marlisle KAL. Rules will be specified in our Ja, Wol group on Ravelry, but we love the thought of using one yarn from stash and one local yarn. Meaning locally produced or bought from your LYS.